Okay, I couldn't wait to read this book even though I'm only halfway through my education, but it’s a great book! 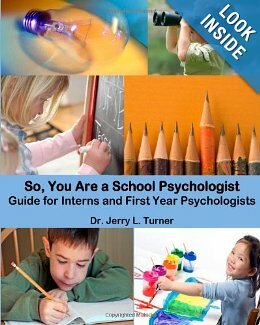 In "So, You Are a School Psychologist: A Guide for Interns and First Year Psychologists", Dr. Jerry L. Turner provides information on what to expect during your initial years as a school psychologist as well as practical advice and relevant forms. The topics covered range from office requirements, to case management tips, to communication with staff and parents, to being professional. At the end of every chapter, Dr. Turner includes a review of the most important points. Chapter resources include interview and observation forms, sample reports, sample meeting agendas, and email templates. kay, I couldn’t wait to read this book even though I’m a year away from internship and only halfway through my education. As a student not having fully immersed myself in the career yet, some of this information is probably lost on me because I don’t quite understand all of the complex roles that school psychologists fill every day. But after reading this book, I know more about what to expect and I feel more confident that I can one day, in the words of NASP’s vision statement, help “all children and youth thrive in school, at home, and throughout life”. I find myself looking forward to utilizing the "delay-sending" option in email, perfecting my listening skills, and wowing people with my ability to manage my time and my knowledge of behavior interventions. You can buy Dr. Turner’s book in paperback and kindle versions on www.amazon.com and paperback on www.barnesandnoble.com. You can also find out more information about the author on www.DrJerryTurner.com. Practicum update: I haven’t visited my practicum site, but I will be sure to update when I do! My first task (other than establishing excellent rapport with any and all teachers, students, and staff and navigating my way through the school) is to identify a student for a consultation case who presents with an academic concern in the classroom. The goal? Consult with the teacher, identify and define the behavior of concern, observe the student, choose an intervention, and monitor progress after the intervention has been implemented. I am looking forward to getting started!